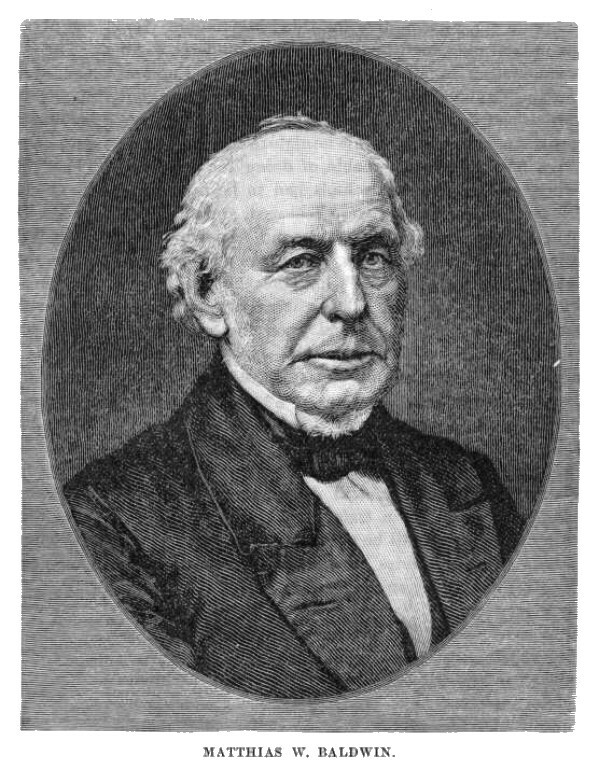 Matthias W. Baldwin was born in Elizabethtown, New Jersey, December 10, 1795. His father, William Baldwin, was a carriage maker by trade, and at his death left his family a comfortable property, which by the mismanagement of the executors was nearly all lost. His widow was thus left to her own exertions for the maintenance of herself and family. To the necessity for economy and self-reliance thus imposed, young Baldwin probably owed the first development of his inventive genius. From early childhood he exhibited a remarkable fondness for mechanical contrivances. His toys were taken apart and examined, while he would produce others far superior in mechanism and finish. When sixteen years old he was apprenticed to Woolworth Brothers, jewelry manufacturers, of Frankford, Pennsylvania, and while serving his time he commanded the respect and esteem of both his associates and employers. Having mastered all the details of the business, thus becoming a finished workman, and having attained his majority, he found employment in the establishment of Fletcher & Gardiner, Philadelphia, who were extensive manufacturers of jewelry. He soon became the most useful man in the shop, his work being delicate in finish and his designs characterized by great originality and beauty. In 1819 Mr. Baldwin commenced business on his own account; but in consequence of financial difficulties, and the trade becoming depressed, he soon abandoned it. His attention was then drawn to the invention of machinery; and one of his first efforts in this direction was a machine whereby the process of gold-plating was greatly simplified. He next turned his attention to the manufacture of bookbinder's tools, to supersede those which had been, up to that time, of foreign production. He associated himself for this pur pose with David Mason, a competent machinist, and the enterprise was a success. Indeed, so admirable were the quality and finish of the tools, especially as they were of an improved make, that the book trade was soon rendered independent of foreign manufactures. He next invented the cylinder for printing of calicoes, which had always been previously done by hand presses; and he revolutionized the entire business. The manufacture of these printing rollers increased so greatly that additional accommodations were necessary. Here again he effected an improvement, first using horse power as a substitute for the hand machinery and foot lathes, which in its turn gave way to steam power. The engine purchased for this purpose not meeting his wishes, he built one himself, from original drawings of his own. This little engine of six horse power, occupying a space of six feet square, was long in use, driving the whole machinery of the boiler shop in the locomotive works on Broad street, Philadelphia. His mechanical genius found immediate recognition, and he received many orders for the manufacture of stationary engines, and they became his most important article of manufacture. When the first locomotive engine in America, imported by the Camden & Amboy Railroad Company, in 1830, arrived, he examined it carefully and resolved to construct one after his own ideas; and after urgent requests from Franklin Peale, the proprietor of the Philadelphia Museum, built a miniature engine for exhibition. His only guide in this work consisted of a few imperfect sketches of the one he had examined, aided by descriptions of those in use on the Liverpool & Manchester Railway. He successfully accomplished the task, and on the 25th of April, 1831, the miniature locomotive was running over a track in the museum rooms, a portion of this track being laid on the floors of the transepts, and the balance passing over trestle work in the naves of the build ing. Two small cars, holding four persons, were attached to it, and the novelty attracted immense crowds. The experiment resulting well, he received an order to construct a road locomotive for the Germantown Railroad. He had great difficulty in procuring the necessary tools and help. The inventor and the mechanic worked himself on the greater part of the entire engine. It was accomplished, finally, and on its trial trip, November 23, 1832, proved a success. Some imperfections existed, but these being remedied, it was accepted by the company, and was in use for twenty years thereafter. The smokestack was originally constructed of the same diameter from its junction with the fire box to the top, where it was bent at a right angle and carried back, with its opening to the rear of the train. This engine weighed five tons, and was sold for $3500. Two years elapsed before he ventured upon building another, as he had seemingly unsurmountable difficulties to encounter; there were so many improvements to be made, and the lack of skilled labor, and above all of necessary tools and machinery, was so great, that he almost abandoned the work. In 1834 he constructed an engine for the South Carolina Railroad, and also one for the Pennsylvania State Line, running from Philadelphia to Columbia. The latter weighed 17,000 pounds, and drew at one time nineteen loaded cars. This was such an unprecedented performance that the State Legislature at once ordered several additional ones, and two more were completed and delivered the same year; and he also constructed one for the Philadelphia and Trenton Railroad. In 1835 he built fourteen; in 1836, forty. Then came the terrible panic of 1837, which ruined so many houses throughout the land; he also became embarrassed, but calling his creditors together, he asked and obtained an extension, and subsequently paid every dollar, principal and interest. His success was now assured, and his works became the largest in the United States, perhaps in the world. Engines were shipped to every quarter of the globe, even to England, where they had been invented—and the name of Baldwin grew as familiar as a household word. He was one of the founders of the Franklin Institute. He was an exemplary Christian, and of a charitable and benevolent disposition. He died September 7, 1866.